Post Name : Sr.Assistant Engineer . Diploma in Mechanical/Electronics & Communication/Electrical subjects from recognized Institution. Fifteen years Post Qualification experience in in the Armed Forces in the areas of Assembly/ Integration/ Testing/Documentation/Inspection. Age Limit : The Senior Assistant Engineers must be attained age limit 40years as on 30/09/2014. Upper age limit for SC/ST/OBC/PWD candidates as per Govt. guidelines . 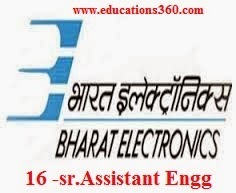 How To Apply : Candidates can apply through Prescribed application format and fulfilled application, supportive documents, recent passport size color photograph send to Bharat Electronics Limited, Post Box No. 1334, Jalahalli Post Office, Bangalore – 560 013.